High in protein, dried beans of all types are very popular in Spain. In this recipe we've saved time by using canned cannellini beans, but you could also use flageolet beans or dried, fresh or frozen broad beans. Chorizo Puchero is a type of sausage. 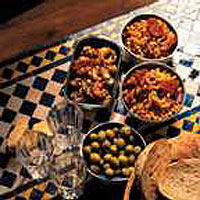 Either serve as one of a selection of tapas dishes or to accompany another vegetable or rice dish. In a large frying pan, soften 1 finely chopped onion in a little olive oil. Add 225g bacon lardons and a clove of garlic, crushed, and fry for 2-3 minutes or until beginning to brown. Add 225g sliced chorizo and continue to fry for a further 2 minutes, stirring occasionally. Add 2 x 410g cans cannellini beans with 75ml dry white wine and a handful of freshly chopped mint. Simmer for 3-4 minutes until the liquid has almost evaporated. Season and serve.